A girl keeps sleeping inside of the ruins. 19 years old whom is said, in fact, keep sleeping for over 3000 years. 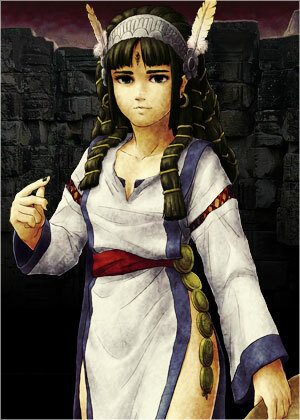 She is one of the clan of the Four Philosophers who are also keep living inside of the same ruins, and keeps her everlasting life by the way which is different from the Four Philosophers,because of the distinguished intuition she has from her childhood. If you can release her from the dormancy, her wealth of knowledge about the ruins must be helpfull.However, she has trouble waking up because of the thousand years sleeping. Using her brain makes herself to be sleepy, and she may be sleeping on your visit. She is still a teenager and curious about the trend of the present day.